You can play any golf course in Ireland, stay in any kind of accommodation from budget bed and breakfasts to luxury hotels, castles or manors, drive yourself or be driven by a personal chauffeur. The choice is yours. We will reserve your accommodation in advance. You can stay in bed & breakfasts, guesthouses, hotels, castles, stately manors or 5-star luxury hotels. The choice is yours. For more information see our Accommodations section. Car rental includes CDW, insurance, 24-hour roadside assistance, unlimited mileage, all taxes. 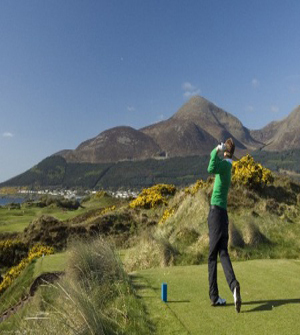 For even more ideas on Golf tour, check out our dedicated golf site -> Tourism Ireland Golf. Contact us! It's fast and easy to get an exact price.